As we recover from the crowd-crushing madness that is the NY Comic Con, I’m making my way through press releases and wanted to share this update about the legendary rockers in Kings X. Check it out. Australia’s leading international independent record label, Golden Robot Records, continues to grow at an unprecedented pace. The label is absolutely thrilled to announce that globally revered, Billboard-charting rock icons KING’S X are now part of their ever-growing international roster. KING’S X recently signed a global deal with Golden Robot Records which will see their long-awaited forthcoming new album released worldwide in 2019 via Golden Robot Records’ partners in the U.S., Europe and Japan. The Details: For those who have followed my Contests area on PiercingMetal some of the text in this might sound a little bit repetitive and I will be straight with you and say that it’s almost a word for word redo with a light modification. 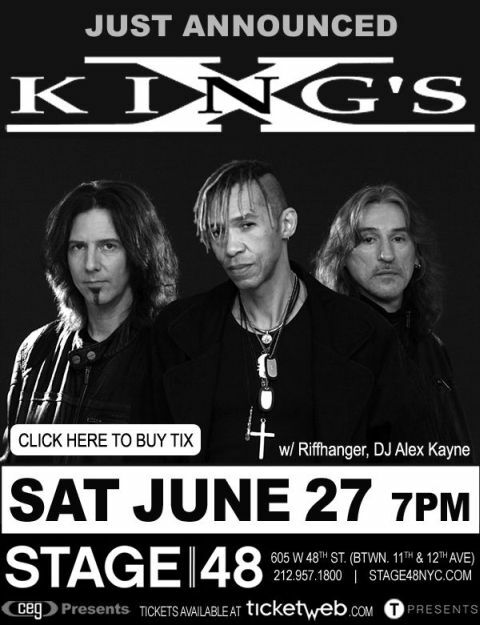 The guys in King’s X are road warriors and one of the best sounding bands that I have ever had the pleasure of seeing in concert. It’s a fact that they’ve never disappointed their fans yet in terms of great gigs and solid recordings. Those of you who have similar experiences are likely nodding your heads along to the statement and yet despite this there are far too many people that have not a single idea about what this band holds in their musical grasp. 2018 finds them still pushing forward with the musical charge and on the cusp of their fortieth anniversary as a band. That said, I am once again super excited to say that thanks to the folks from CEG Presents, some lucky PiercingMetal fans will be hitting the show for free when they perform at Sony Hall. This will mark my fifth contest for the band and brings the PiercingMetal outlet a little bit closer to our 1700th ticket. Isn’t that cool? We like to think so. The rules on how to participate are below. *** This show will start early so make note of it. The Details: I have said this before and I shall do so once again, King’s X are road warriors and one of the best sounding bands that I have ever had the pleasure of seeing in concert and I have to say that they have not disappointed their fans yet in terms of great gigs and solid recordings. Those of you who have similar experiences are likely nodding your heads along to the statement and yet despite this there are far too many people that have not a single idea about what this band holds in their musical grasp. 2015 finds them still pushing forward with the musical charge after some adversity and it wasn’t too long ago that the seminal “Gretchen Goes To Nebraska” hit the quarter century mark. (click the text for our toast to this musical milestone). With that being said, I am once again super excited to say that thanks to the folks from CEG Presents, some lucky PiercingMetal fans will be hitting the show for free when they hit the beautiful Stage 48 club on the West Side. Read more on how you get in on this. According to the poster the band will be joined by DJ Alex Kayne and the band Riffhanger as support.